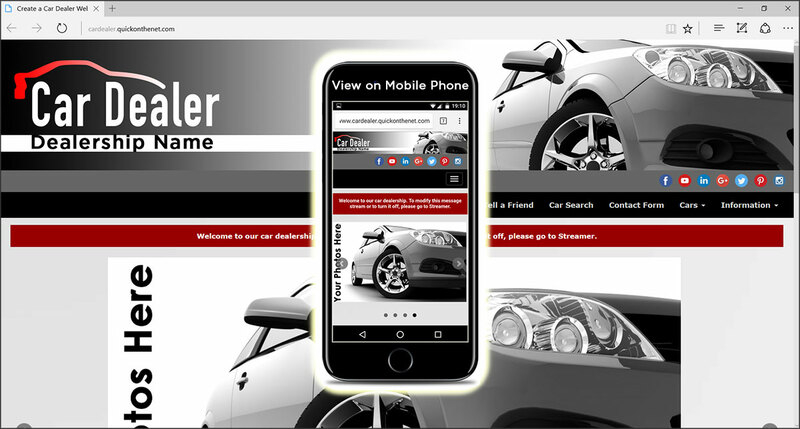 Are you ready to build your own car dealer website? This is fast and easy! In fact, we believe it cannot be made any quicker, simpler or cheaper than this. As an auto dealer, it’s all about car sales! You need an easy-to-use website, which is designed to present appealing photos of your cars and attract the attention of new buyers. We give you the tools to keep your website up-to-date with your latest vehicles; and we also make it easy for you to remove the cars you have just sold. With web hosting included, your new website already includes a stylish car logo. However, if you prefer, you can upload and insert your own business logo. For your buyers, your website is quick and easy to use. Your cars are fully searchable, based on the keywords you add to each automobile (each gallery item).